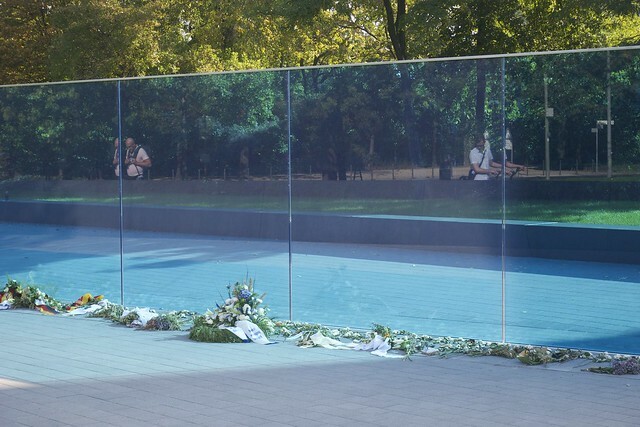 If there’s one thing Berlin has in spades, it’s history. Lots and lots and lots of history. Much of it is depressing – the kind of history you want to forget but don’t because it should never be forgotten. Like the Nazi’s Aktion T4 program that killed people who were judged to be insane and incurable; “Mercy Death,” if you will. The program was based at Tiergartenstrasse 4, right in the heart of Berlin. Today the site is, primarily, home to the Berlin Philharmonic. 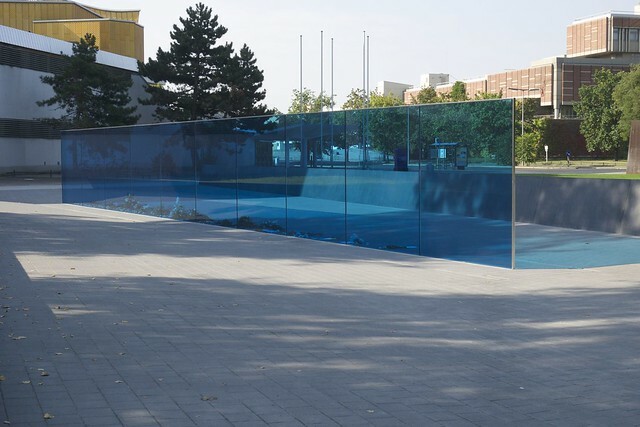 It is also, as of last Monday, the site of a memorial to the murdered: a 79 foot long blue glass wall. This morning I had some time and was in the area – so I stopped by. Adjacent to the wall is a long informative panel, helping to contextualize the murders and put bring it all into focus: forced serializations, mercy killings, and falsified death certificates – to name a few. A few select individuals are highlighted. It’s a complex display: spoken information with video in German, braille, simplified German language text (in bold yellow print), German text (in bold white print), and English (in a thin, difficult to read, white font). 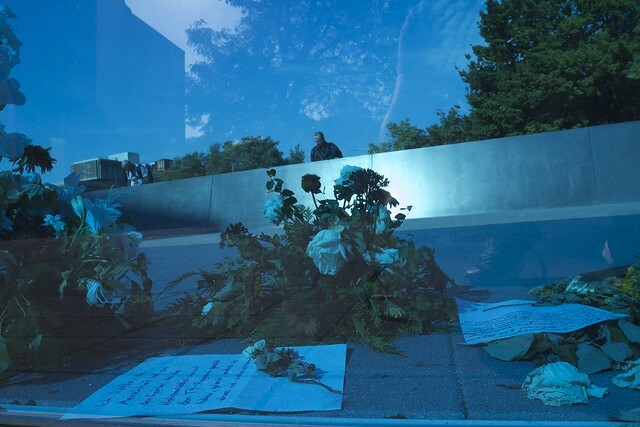 Thus it is accessible to many of the very people who were the targets of Aktion T4. 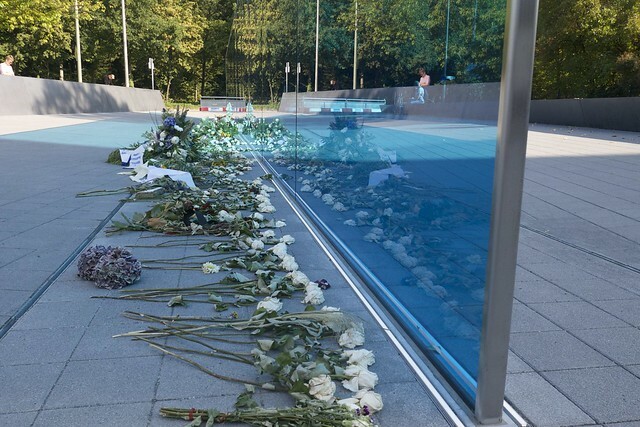 Berlin is home to a plethora of memorials – within a short walking distance there are three other memorials to the Nazi genocide: the gays, the Jews, as well as the Sinti and Roma. 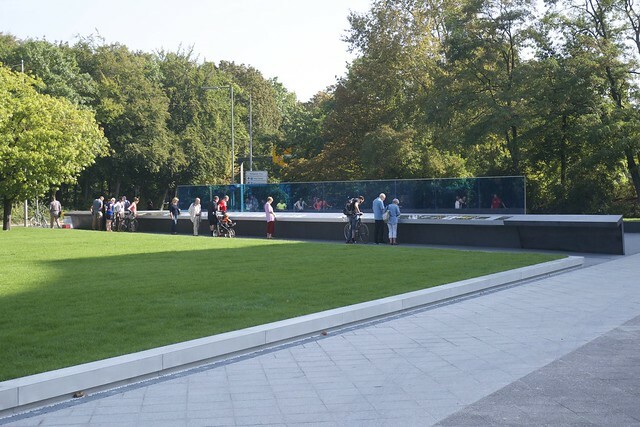 On some level, it’s easy to imagine that there is memorial fatigue: I can only imagine that the dedicated Nazi holocaust memorial visitor would be visit all four in the space of a single day and leave either depressed or numb – these are, I think, memorials that need time and space between visits in order to keep the impact at a respectful and worthwhile level.